Yoga is a journey that doesn’t always follow a straight line. 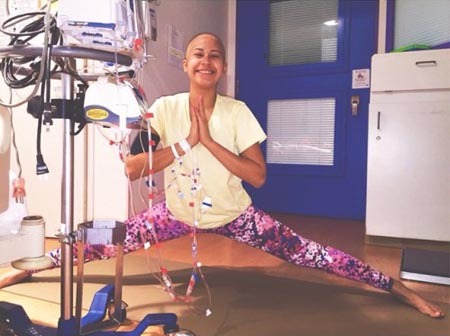 No one knows this better than Briana Donis, an inspiring young yogini who’s committed to her practice—even when she’s confined to a hospital isolation ward because of a rare blood disease. 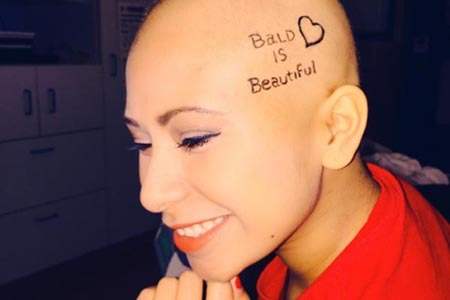 19-year-old Briana was diagnosed with aplastic anemia a year ago. This disease keeps her body from producing red blood cells, causing serious bleeding, fatigue, and immune deficiency. Since her diagnosis, she’s had to spend months in the hospital, often in isolation because of her compromised immunity. But that doesn’t stop Briana from doing what she loves! 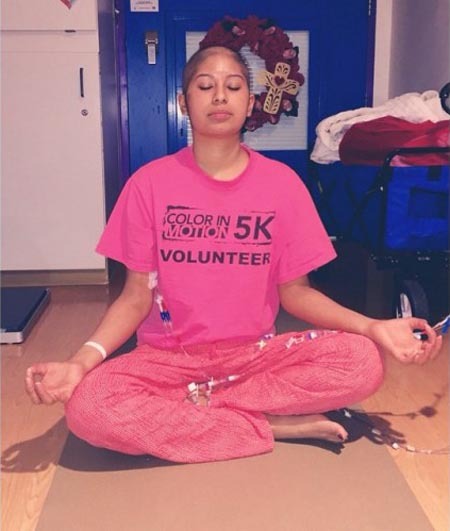 Even after setbacks because of her health, Briana is still practicing yoga regularly. "Physically my body's weak and it's like I'm starting this journey over again, but I know I've done it before, I can do it again, and that's what I'm pushing for every day," she says. As Briana will tell you, yoga isn’t all about building physical strength. "I love the strength [!i!] because it's not just a physical one—it really is a mental one, and inner one, and that's what keeps me doing it because I love the challenge,” she says. Her yoga and her medical struggles have taught her wisdom beyond her years. "I just want people to not stress over the little things in life," she told People magazine. "I want them to be inspired [!and!] that they are strong too. Even if it's a little thing or it's a big giant they're facing, they can overcome it." Briana recently received a second bone marrow transplant that will hopefully allow her body to produce red blood cells on its own. If it’s successful, she’ll be able to continue her practice at home instead of in the hospital. Until then, she’ll keep on inspiring us with her awesome asanas captured on her Instagram page. “I'm still doing my yoga because I love it," she says, proving that anyone can make space for yoga in their lives. “This girl in this hospital is doing it, so why can't you?" Make sure to follow her on Instagram here!